Are There Lead Paint Removal Requirements for Property Owners? For many decades after its inception, lead was a key ingredient in commercial paint products designed for American homes. Lead-based paint has a lot of health risks, but it took until 1978 for the U.S. Consumer Product Safety Commission to enact federal legislation to ban the manufacture of toxic lead-based paint in consumer-designed products. Of course, that didn't retroactively apply to the more than 24 million homes and apartment buildings that were constructed before 1978. Even just minimal exposure to lead-based paint can be a hazard to you. This is because lead will infiltrate a person's bloodstream once it has been ingested through lead paints or breathed in from paint dust. While short-term health hazards include muscle pain, digestive problems, headaches, and attention disorders, nasty long-term problems like kidney damage, learning disabilities in kids, and nervous system problems can occur following regular exposure. While there is currently no law requiring California property owners to remove lead-based paint, there is legislature that requires landlords to present written disclosure to current and prospective tenants detailing the location of known lead-based paint in the building. In addition to this disclosure, the property owner must also provide a federal government endorsed pamphlet outlining the risks of lead poisoning. In 2010, federal legislation, commonly known as the Renovation, Repair, and Painting Rule, was enacted to tackle some of the more pressing lead paint removal requirements desired by home safety advocates. 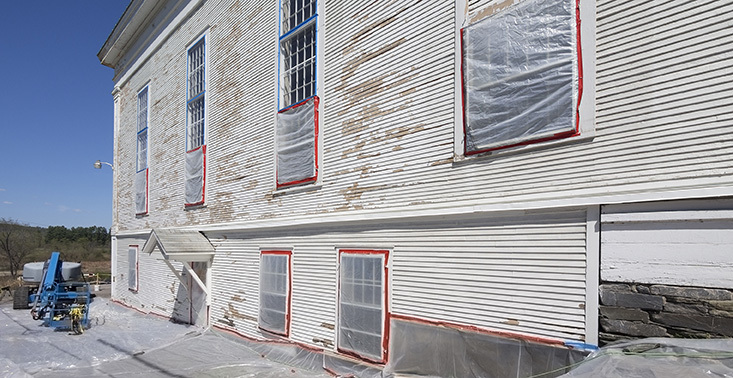 This legislation mandated that, if you wanted to renovate a building built before 1978, any hired renovators would have to receive a mandatory licensing specifically for lead-based removal. In California, there are contractors and painters who have undergone this certifications and who be hired before you undergo any renovations. Inspector/Assessor Certificate This certification is designed solely for those people who will inspect a building for lead paint. This certification includes the ability to assess the level of hazards and best course of action for problem areas. Project Monitor Certificate This certificate is designed for persons who would be overseeing lead-related work. Their job is solely ensure that the proper lead paint removal requirements are being followed. Supervisor Certificate This certificate is designed for people who would be on hand to daily supervise any activities that involve handling lead-based products. This certification also includes preparing and enacting lead removal plans. Worker certificate. Any worker who is handling the removal of lead-based paint on your property must have this certification. The Worker Certificate This certificate is designed for anyone who will be working underneath the supervisor in building containment structures to seal off work areas in order to prevent lead dust spreading, removing lead-based paint hazards, preparing the work waste that includes lead contamination for proper disposal, and cleaning the site. If you are a property owner and fail to provide your tenants with a detailed disclosure regarding the lead paint on your property, distribute the appropriate pamphlets, and/or use the correct certified lead-removal contractors and painters, you can face significant legal penalties. Because lead poisoning has the potential for such dangerous long-term effects, you could face hefty fines, lawsuits, and the possibility of jail time for failure to follow lead paint removal requirements.